It's not hard to imagine how important this album must have seemed when it, or most of it, first appeared on LP in 1964. Not only was it a field recording of two unknown street musicians, playing the purest rural blues apparently in splendid isolation from the mainstream; it was also evidence that the blues was, as the enthusiasts were (and are) wont to assume, essentially African in origin. The cover of the first LP issue - reproduced on the CD inlay - went so far as to state unequivocally that Eddie Jones accompanied himself 'on a home-made African derived Zither-Monochord'. Clearly, such an instrument could only be one of those features that were to become known as 'African retentions' in American music. John Crosby's short note (the only new commentary, apart from a bizarre endorsement by Captain Beefheart, reprinted from 'Mojo' magazine) makes the agenda clear. 'At the time … musicologists were actively attempting to classify all the various traits & styles of African-American music by strongly emphasising the African roots of the blues.' He goes on, quite rightly, to say that 'Jones' improvised instrument & music overwhelmingly bear testament to the kind of personal resourcefulness and performance skills any talented individual inevitably brings to the folk process'. Hear, hear! The Africanist approach, far from being a proper acknowledgement, surely tends to underestimate the achievement of black American musicians, in creating a range of musical forms that have come to dominate the popular music of the global village - including Africa. Eddie 'One String' Jones had nothing so say about his music's origins - nor about his own, for that matter. His name may or may not have been Eddie Jones. It may or may not have been Jessie Marshall. Those with an ear for regional accents and styles will have a fine time deciding where he came from. One day in 1960, he approached Frederick Usher in the skid row section of Los Angeles. He was carrying a rough piece of timber, with a single broom wire stretched along it, and a tin can mounted over one end. 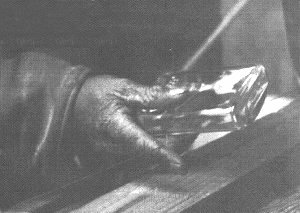 He played it by sliding a half-pint bottle along the wire with his left hand, while striking it near the resonating can with a little whittled stick in his right hand. As a beggar, he no doubt relied heavily on the novelty value of his instrument, and he was happy to allow listeners to assume that it was his very own invention. He boasted of a daughter who could play as he did, but gave no other indication that the instrument and technique were anything but peculiar to himself. Nor would he countenance the notion that his device was in any sense a substitute for a guitar (like the home-made contraptions recalled from childhood by many a professional bluesman); he was proud to demonstrate 'the onliest music that can't be captured by six strings'. There is no good reason to assume that Jones's instrument was of 'African' descent. The musical bow surely should be considered the archetype of all stringed instruments, and mono-chords of one kind or another can be found everywhere in the world, especially wherever musical accompaniment has to be cheap, highly portable, temporary or improvised. Ironically, Jones's practise of sounding the string percussively with a stick - which, together with the left-hand sliding, Usher thought to be 'entirely his own' - may well be the most 'African' element in his method. As for that sliding: for some reason, many people still find the influence of Hawaiian music insufficient explanation for the development of slide guitar techniques but, supposing that black Americans were a separate independent source of the basic slide method, it would be reasonable to assume that a black American discovered it, just as (if we are to believe the established version of the story) a known individual in Hawaii did. Fortunately, this album need not be justified by any dubious ethnomusicological assertions. It contains highly creditable performances of blues standards (Rolling and Tumbling, John Henry, Baby Please Don't Go, The Dozens), by a fascinating character at the height of his powers, playing the kind of instrument that most blues fans have only read and wondered about. Eddie Jones was rightly proud of his ability. Having recorded for Usher in a back alley, he readily agreed to a couple more sessions, including a performance for a private party, which he openly resented having to share with Usher's other find, Edward Hazelton. After that, he slipped back into terminal obscurity, leaving behind only these recordings, and one of his instruments (a full blown concert required two of them, apparently). If this chance encounter had occurred only a couple of years later (or, perhaps, if the recordings had been published sooner after the event), he might well have enjoyed some sort of career on the burgeoning blues scene. His 'support act' was a very different character. 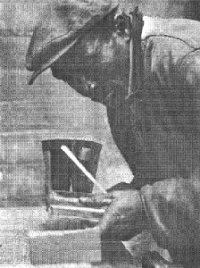 As introverted and reflective as Jones was flamboyant and assertive, Edward Hazelton, too, was a drifter, originally from South Carolina, who relied for his musical accompaniment on that more familiar vagrant's standby, the harmonica. Inevitably, there is less to be said about him, unless blues harmonica happens to be your special interest. Suffice it to say that he sings well, in a high, clear voice, and knows all the usual harmonica tricks. He provides six of the fourteen performances on the album (any reader who happens to own a copy of the LP will be interested to know that the CD contains three extra tracks by each artist). The album opens with an interview with Eddie Jones, in which he explains his instrumental method, and the various nicknames it has earned him. By some unfathomable logic, he is known in some quarters, he claims, as a 'three-quarter banjo picker'. Usher asks him why that is. 'Cause I don't have but one string,' Jones replies. Ah, yes, of course …. This beginning makes good sense to anyone who is interested, but is pretty offputting to the unsuspecting casual listener. Try playing this album to anyone who isn't a blues anorak, and watch the eyes glaze even before the music starts. Serious blues enthusiasts who don't have this CD already will certainly want it, and will certainly enjoy it. Those who like to play music in the background should certainly avoid it.